John died in Morgan County in 1835 but was buried in Noble where his son Benjamin, my other grandfather, can be found just a few feet away. 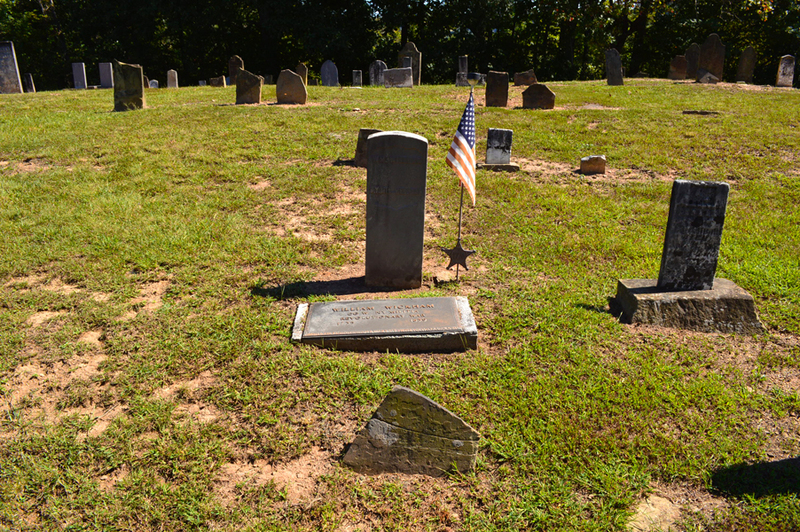 In June of 1846, Benjamin and his wife deeded an acre of ground to the Trustees of Olive Township, “Where the graveyard now is.” My 5th great grandmother, Jerusha Ascenith Weekley Ackley is also buried here. Jerusha’s daughter Esther, my 4th GGM, married Jeremiah Wickham, who happens to be the great grandson of my John Wickham. Esther and Jeremiah Wickham are buried just miles away at Archers Ridge along with many, many other Wickham & Archer ancestors of mine. The families are quite connected! The grave site of William “John” Wickham. 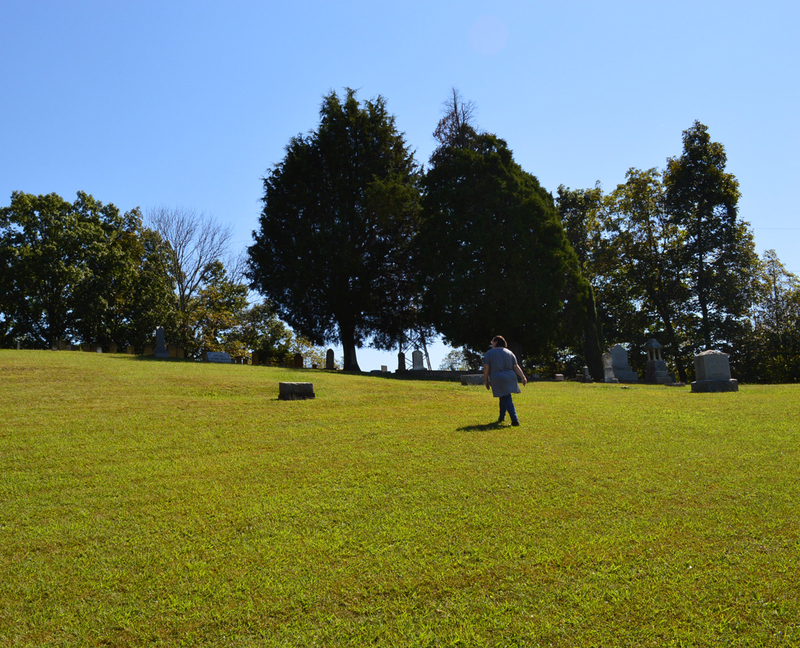 The steep climb to the top of Devoll Cemetery. The “newer” and maybe incorrect plaque of William and/or John Wickham. The craggy tree at Devoll. 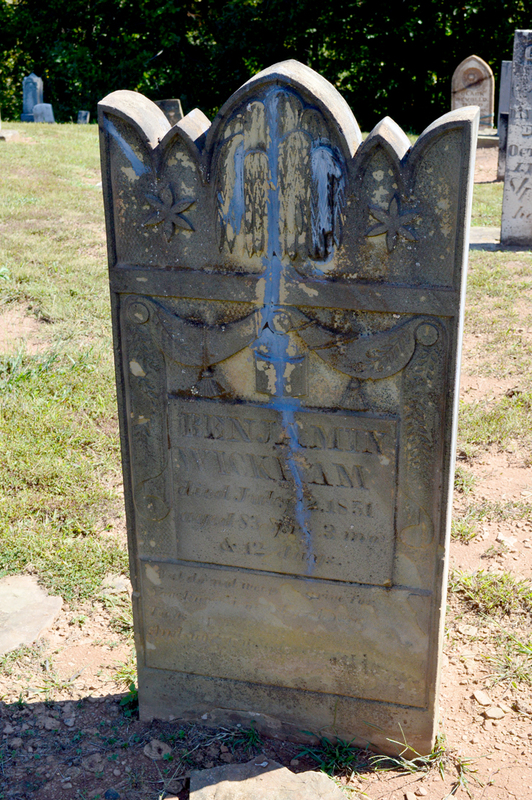 Benjamin Wickham, John Wickham’s son, who gave land for the cemetery there. 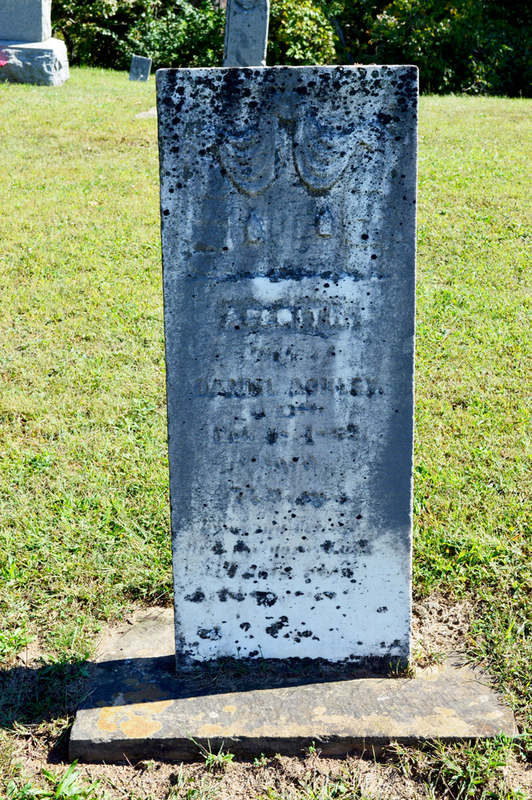 My 5th great grandmother, Jerusha Ascenith Weekley Ackley, is also buried here. Both Devoll and Archers Ridge Cemeteries are accessed by dusty gravel roads, which is something that I don’t see much of here in New York! 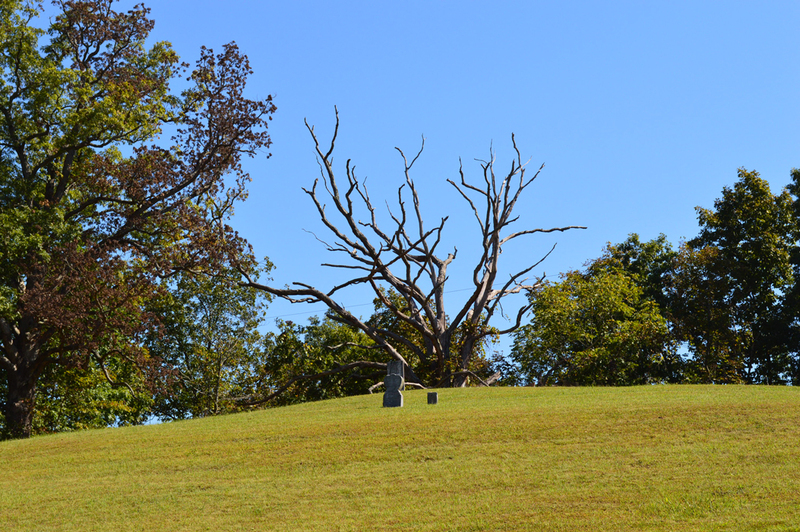 We found Devoll Cemetery (sometimes known as Devol or Devold) situated high up on a steep hill with a craggy (and somewhat creepy) tree. All it was missing was a murder of crows perched menacingly on the branches! Nearly all the stones are illegible, having been worn away with the elements and time. A good portion of them are broken or severely damaged and some are just sad, little stumps. The grounds were freshly mowed and well-tended – it is nice to know that someone, somewhere cares enough to still watch over them. Climbing up that hill, I found John Wickham nearly smack dab in the middle, American flag waving in the slight breeze. There is a broken stone there, which I imagine was his original stone but it’s completely worn so no name could be deciphered. There is a replacement Civil War era stone there and a “new” replacement plaque that was installed some years ago by a Wickham/Merry family member. 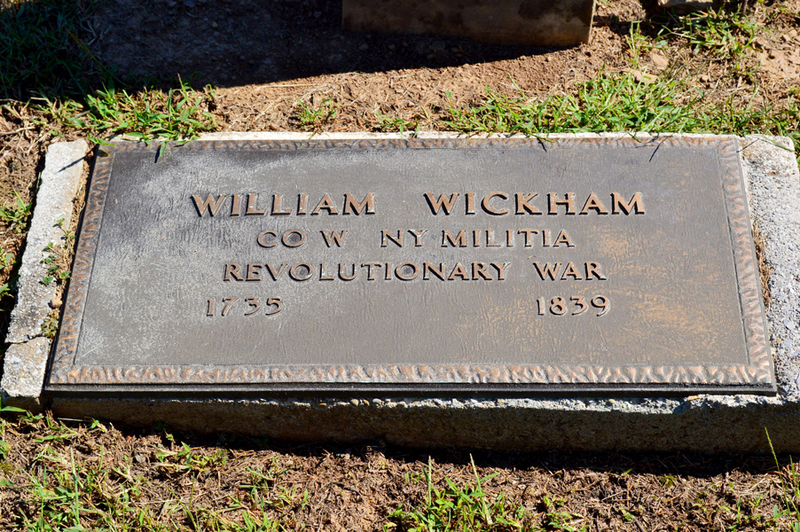 Did you catch that it says William Wickham and not John? Well, that’s a source of debate among Wickham researchers and there is even a discrepancy over the new plaque’s date of 1839. (My records and others say he died in 1835.) In any event, people are still working to determine if William and John Wickham ARE one in the same. Some of us have even compared our DNA on GEDMatch but we’re not having much luck unfortunately. Standing there next to his grave, it again hit me how strange it is that for nearly all my life, I lived within two hours of his resting place and never even knew about him (or any of them) until just about a year and a half ago. I’m so proud of John Wickham and his contributions to our country’s turbulent beginning. Without men like him to help train “green behind the ears” farmers and volunteers, the outcome might have been very different. I did not see a DAR emblem for him and am going to contact the DAR to find out if he’s ever been officially marked. If not, I will be ordering one and contacting the local chapter about a dedication ceremony for him. I’m happy I went and found them….